← Are you in a job or a Movement? 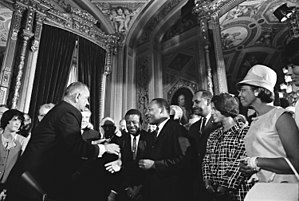 President Lyndon B. Johnson meets with Martin Luther King, Jr. to sign the Voting Rights Act of 1965. The good news: Racism is over. The bad news: This is the lie we keep telling ourselves while racist actions are still happening at the highest levels of government. For instance, a recent FBI investigation in Alabama recorded state senators referring to Black citizens as “Aborigines,” and openly discussed keeping a referendum off the ballot because it might increase Black voter turnout. One said, “every Black, every illiterate” would be bused to the polls on “HUD-financed buses.” These are 2010 conversations that became public in United States v. McGregor. The ugly news: Congress needs to re-draft a law defining where racist voting practices should be reviewed under the §5 standards. Justice Kennedy wrote the Court’s Shelby County v. Holder ruling in a manner that does not follow precedent, furthering the cynicism of those who feel courts merely do what is in their heart and then write a bunch of mumbo-jumbo to serve as “The Law.” Ultimately the Court held that Congress would need to write a new formula to determine which states (or political jurisdictions) should be held to closer scrutiny. They felt, definitively, that if Congress were to draft the formula today it “plainly could not have enacted the present coverage formula.” But is that so? Justice Ginsberg’s scathing Dissent notes that Shelby County, Alabama would certainly be covered by any formula. (3) Annexation of white areas into a municipality while refusing to include similar non-White areas. This is one way to change the demographics of your city or town: redefine the city limits. (4) Using criminal records as a proxy for morality laws that strip people’s right to vote- sometimes before teenagers are even given a chance to vote in the first place. Why do we need a Voting Rights Act at all? The standard for racism is whether it has a disproportionate negative impact on minority groups (ethnic and/or language). This is broader than §2, where it must be shown that the politicians had a racist intent. Justice Ginsburg points out that in many parts of America, particularly these states that are no longer subject to closer scrutiny, voters are severely polarized on racial lines. Thus, when incumbents seek to entrench themselves, they will strategize around creating race-specific disadvantages. But racism is over. It is no longer 1965, says the Court. If the VRA showed no impact on reducing political racial chicanery, then we would not bother renewing a failed policy. But if it worked so much to eradicate it, we can also not bother renewing the successful policy. So how did arguing the middle ground lose? Because the Court ignored a large body of evidence, merely to note that registration of Black voters is similar enough to White voters. The Court fails to reconcile the fact that although the (formerly) Covered Jurisdictions account for under 25% of the American population, they generate 56% of successful litigation under §2: intentional racial discrimination. In 2001, the mayor (and the all-White alderman) of Kilmichael, MS decided that the answer to so many Black candidates for office was to not hold elections at all. After DOJ demanded elections, a Black mayor and three Black aldermen were elected. The most twisted irony of this Conservative majority ruling is that, under the Court’s own precedent, a facial challenge to the law is the hardest case to make. As Justice Ginsburg succinctly points out (quoting Justice Scalia, for instance, in prior cases): if a law is capable of being constitutional anywhere, then it can’t be simply struck down as a whole. No county in Alabama, such as Shelby, is in position to argue that the VRA is unconstitutional. Perhaps a place without such a rich history of racist policies should have been the model plaintiff, but not Shelby County- who likely should have lost the even lesser argument of an “As-Applied” constitutional challenge. (The law may be constitutional on its face, but as it is applied in this case it violates Due Process, Equal Protection, etc.). The Court took this case not to rule in regards to Shelby County, AL, but for all of America. This contradicts their stance on deciding particular controversies. Certainly any new formula will include Alabama as a state to watch closely. Shelby County uses an at-large voting scheme that is tainted by racial discrimination, yet today’s ruling lets them off the hook by saying that other jurisdictions might be unfairly covered by §5 of the VRA. How quickly Justice Scalia forgets a 1987 case where he agreed that, under the VRA, a city could not annex areas based on racial motivations: City of Pleasant Grove v. United States happens to be right next door to Shelby County. In 1985 the Court ruled that Alabama’s scheme of disenfranchising people convicted of “crimes of moral turpitude” was illegal (Hunter v. Underwood). Unlike most other disenfranchisement laws, this one was clearly found to have been enacted to target Black citizens of Alabama. The list goes on, in Alabama and elsewhere, some of which is cited by Justice Ginsberg. Does America only have time to talk about race in a racist way? After nearly two centuries of laws that are openly hostile towards non-White Americans, we apparently grew weary after just three decades of discussing and enacting change. Since the 1980’s, people don’t want to hear about racism anymore; many people born since then act as though they lived through the 1950’s, 60’s, and 70’s. At the end of the 1970’s, we learned that the FBI was targeting Black, Latino, and Native American leaders for demise, through imprisonment and assassination. Of course it was a good time to stop talking about race, and pretend it was all an unfortunate past. It is questionable as to whether today’s Congress wants to acknowledge race and racism. We have a Black president, after all, elected by 51% of the voters (which translates into about 25% of the American people). In 1965 people had been actively protesting for a decade. The Supreme Court and Congress watched the news, and coincidentally decisions were made that respected all citizens’ rights to be American. Today we are fractured into as many issues as there are websites and cable channels. To motivate Congress, we may need to assemble in the streets and show that political power will not be snatched so easily by the simple stroke of a fifth Supreme Court justice’s pen. It cannot be overlooked that the Court ruled not to rule on affirmative action in education on Monday; Scaled voting rights back to 1965 on Tuesday; and liberated gay people to get married on Wednesday. It does not take much effort to recognize the value in this order, and what it does to social justice commentators. Even this writer has been criticized for not reserving this day to celebrate the demise of DOMA. Yet it can’t be forgotten in the news cycle- we need to be able to focus on multiple issues simultaneously, and not fall for any Three Card Monty maneuvers not MasterRaceFul tactics of deception. This entry was posted in Commentary, Courts, Race, Voting Rights and tagged Alabama, Disenfranchisement, Ruth Bader Ginsburg, Section Five, Shelby County, Shelby County v. Holder, Supreme Court, Voting Rights Act, VRA. Bookmark the permalink.